I have the dreaded "black" thumb when it comes to indoor orchids. But I can't pretend that I haven't thought about trying to stick one in a terrarium. I alwayws feared that the roots would not get enough airflow. But it might be worth a try. Enter CasaSugar's recent orchid-terrarium-tutorial, which looks fairly straight-forward. Pop an orchid in some spahgnum moss in a jar. 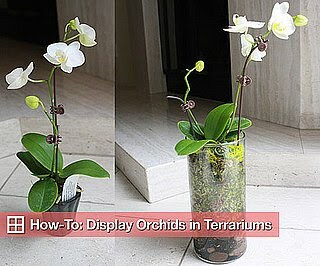 The article clearly says this is a way to "display" orchids and but- does anyone think it could be a long-term solution? CasaSugar: This technique only takes about 20 minutes to complete, and you'll cut down how much you need to feed your plant to about once every few months. No, I'm not joking. Want to learn how to display your orchids in terrariums? Not sure how long they would last - though I've seen this used in garden centres. Did you try it? How'd it work out?